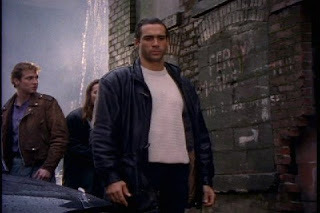 The Angriest: Highlander: The Series: "See No Evil"
It is 1 February 1993, and time for another episode of Highlander: The Series. A masked murderer stalks the streets of Seacouver, attacking women and scalping them for their hair. Duncan Macleod (Adrian Paul) knows the behaviour well: he saw it 70 years earlier when he hunted down an immortal serial killer. That killer, however, is dead. Who is picking up their crimes? Brian Clemens is one of the most noted figures in British telefantasy history. Best known for his work developing and producing The Avengers (Steed and Mrs Peel, not Iron Man and friends), he was also instrumental to Adam Adamant Lives, The Persuaders, and Thriller. "See No Evil" marks his first and only episode of Highlander: The Series, but it is not Clemens' first encounter with the Highlander franchise. Brian Clemens was also one of the writers of the notorious film sequel Highlander II: The Quickening. Do not panic: "See No Evil" does not include any science fiction elements such as mentions of the planet Zeist. On the other hand, it is a dreadfully written episode. It's weakly characterised and makes a sort of cheap entertainment out of women being tortured and murdered. More than that, it keeps up a continuing problem with the series: the producers clearly have no idea of what to do with a Highlander TV series. Highlander the film was about immortals living in secret through history taking one another out in violent protracted sword fights. That is a difficult thing to keep interesting on a weekly television drama, but thus far the production has barely tried. Instead it has gone for the tried-and-true method of adapting fantasy elements to broadcast television - a method still in use in the USA today. The producers have actively tried to make Highlander: The Series a police procedural. Of course it's a terrible idea, since it involves Macleod - or girlfriend Tessa (Alexandra Vandernoot) or friend Richie (Stan Kirsch) - stumble into someone who is a target of murder, or a murderer themselves, or about to become a victim. It is the illogical sort of premise viewers come to expect from Murder, She Wrote and the like, but of course in this case it's rendered to a weird extreme by the local Seacouver police never wising up to the weird antiques trader who owns a bunch of swords always turning up around crimes that regularly involve victims decapitated by swords. This is a bargain-basement awful hour of television, and it's a shame it comes from a writer whose previous work was so effective and entertaining. Highlander gets better than this - in fact it gets a lot better - but if you were watching this back in early 1993 I am amazed you stuck around to see what happened next. We are 11 episodes in, and precisely three of them have been good. The quality ratio slips down to 27 per cent.